Is there a better reason to love cities than enjoying their public spaces, particularly city squares? Well, author of City Squares: Eighteen Writers on the Spirit and Significance of Squares Around the World Catie Marron (CM) agrees. She was at Rizzoli Bookstore to talk about her book, in company with writer Michael Kimmelman (MK), both interviewed by Reed Kroloff (RK). This informal conversation praised public spaces, not necessarily designed but always pedestrian and supporting urban life. Here are a few interesting words from the event I noted in my sketchbook. CM loves to go to the library, and the library is free. This book explores a number of democratic spaces, each described by different authors. There is a strong movement in NY, a new interest in public spaces, with various projects like the High line or the Broadway transformation (RK). The city has been a leader in the conversion of dead spaces to active public spaces. MK talks about other examples in Europe, as opposed to China, where economic development has superseded city; raising civic spaces, health and equity questions. City squares are social and economic triggers. When RK asks if we can design a good public square, as opposed to letting it grow by itself, it is hard to reply. All CM can say, is that best successes are always human scaled. To MK, a good public square is organically linked to its neighborhood. 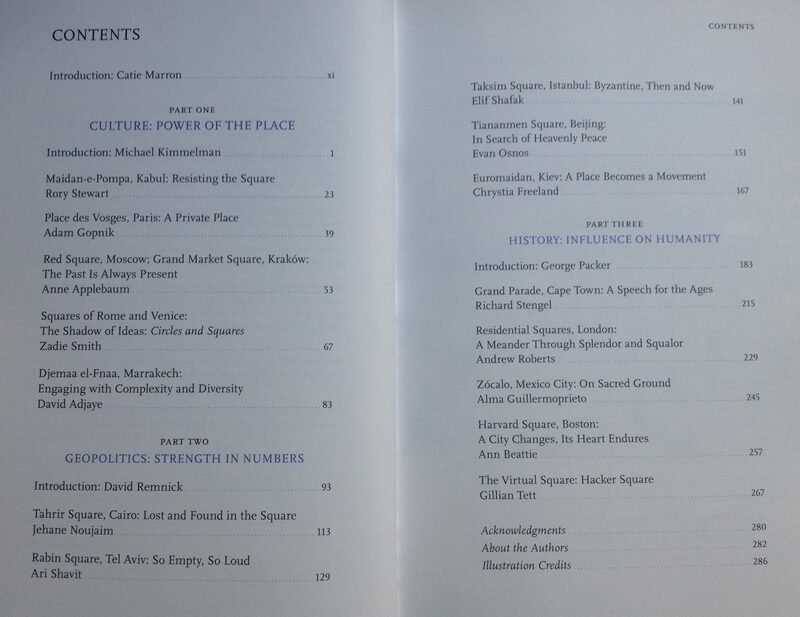 RK notes how public space has become a big question for western cities. For instance, LA is struggling to initiate a city center and pedestrian city life. MK notes that there is a new urban generation that does not want to own a car. On this subject, see this very interesting article by the Atlantic. In any case, this is an essential demand from people. We are social animals (CM). Squares are people. Except when they are empty; then architecture becomes everything (RK). To clarify, MK reminds us that squares are not parks: parks involve the idea of retreat from the city. With the technology -security cameras but also mobile phones in every pocket, ready to shoot anything that might happen- the nature of being in the square is now shifted. All there is left to do is to read that book!